Association (Legal) Name: Western New York Special Hockey Association, Inc. In the summer of 2008, parents in the Western New York (WNY) area near Buffalo decided that a Special Hockey team was a priority to all disabled players in the area, so birth of the Western New York Special Hockey Association, Inc. was started. The players of the "Buffalo Thunder" range from 10 to 35 years old , are male and female, and have one thing common: the eagerness to play hockey and to be part of a team. 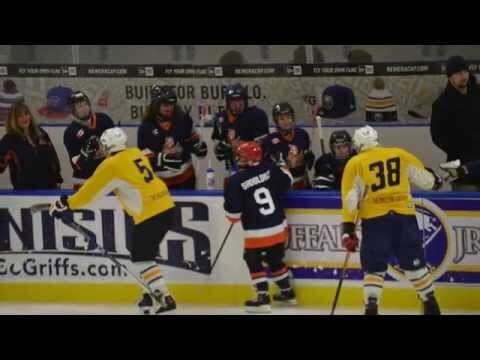 The mission of the WNY program is to provide individuals (both male and female) with developmental disabilities the unique opportunity to play ice hockey. Our mission objectives are: - To provide players the opportunity to feel they are a part of a team; - To provide players the thrill of competition while having fun at the same time; and - To facilitate the development of social skills. Activities include off-ice dryland practices, scrimmage games and tournaments. Player and family events including team parties, picnics, and award ceremonies are performed. All players enjoy a team atmosphere where having fun over winning is the goal.